This example shows how to construct a tform struct that represents a simple shear transformation and then applies it to an image. 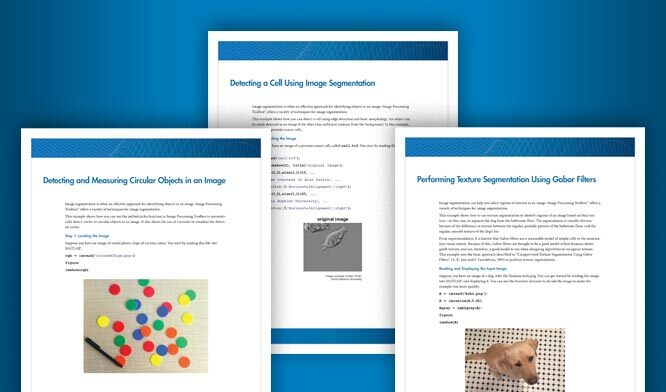 We explore how the transformation affects straight lines and circles, and then use it as a vehicle to explore the various options for image padding that can be used with imtransform and tformarray. yields the values for x and y that you received from the first two equations. Setting a = 0.45, we construct an affine tform struct using maketform. We select, read, and view and image to transform. We choose a shade of orange as our fill value. but this is wasteful since we would apply cubic interpolation along both columns and rows. (With our pure shear transform, we really only need to interpolate along each row.) Instead, we create and use a resampler that applies cubic interpolation along the rows but simply uses nearest neighbor interpolation along the columns, then call imtransform and display the result. Transforming a grid of straight lines or an array of circles with tformfwd is a good way to understand a transformation (as long as it has both forward and inverse functions). 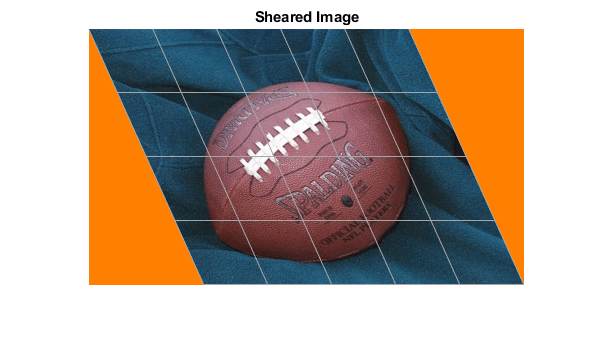 Define a grid of lines covering the original image, and display it over the image Then use tformfwd to apply the pure shear to each line in the grid, and display the result over the sheared image. 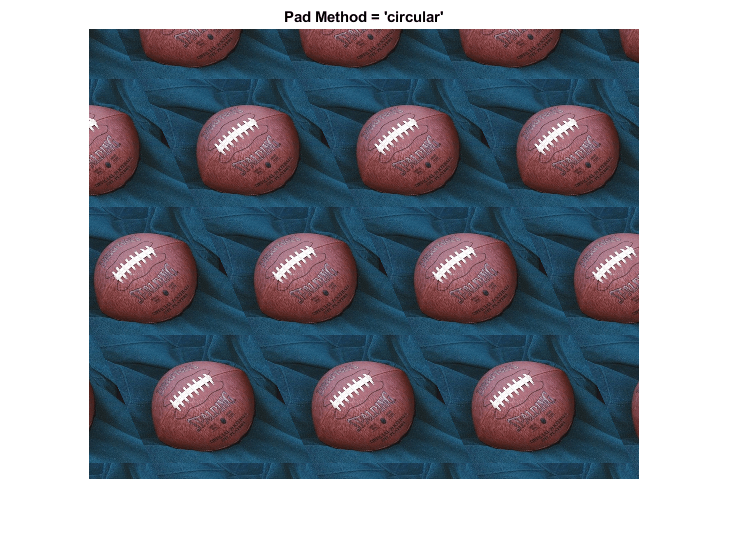 You can do the same thing with an array of circles. When we applied the shear transformation, imtransform filled in the orange triangles to the left and right, where there was no data. 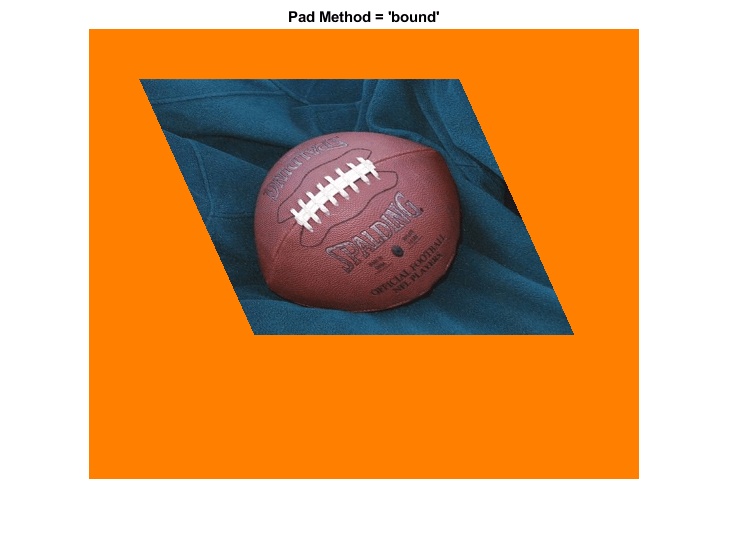 That's because we specified a pad method of 'fill' when calling makeresampler. There are a total of five different pad method choices ('fill', 'replicate', 'bound', 'circular', and 'symmetric'). Here we compare the first three. First, to get a better look at how the 'fill' option worked, use the 'XData' and 'YData' options in imtransform to force some additional space around the output image. 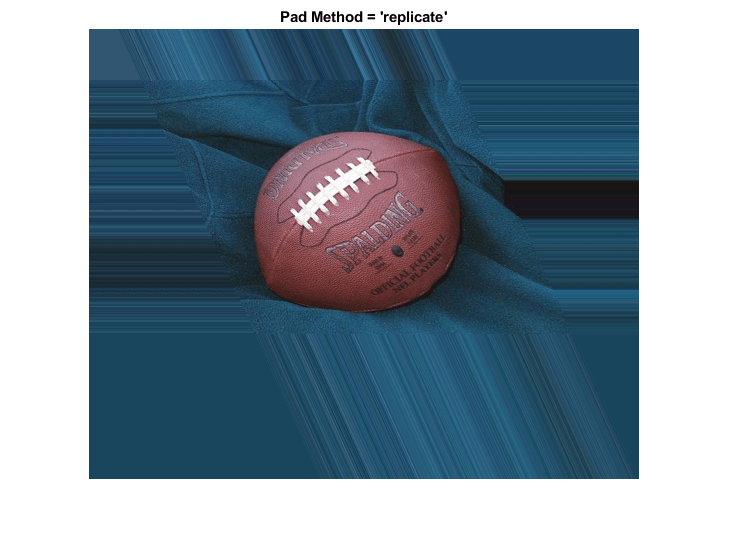 Now, try the 'replicate' method (no need to specify fill values in this case). And try the 'bound' method. 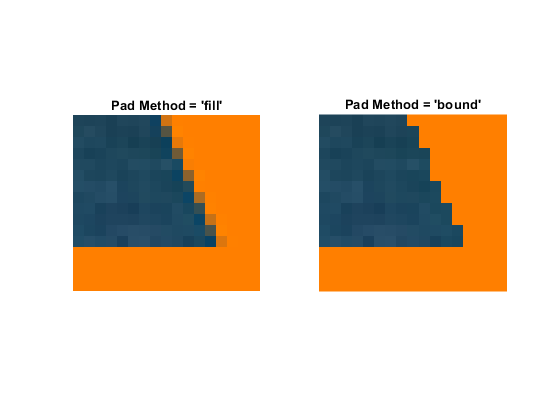 Results with 'fill' and 'bound' look very similar, but look closely and you'll see that the edges are smoother with 'fill'. That's because the input image is padded with the fill values, then the cubic interpolation is applied across the edge, mixing fill and image values. 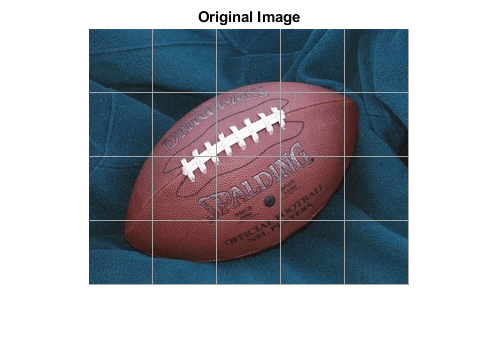 In contrast, 'bound' recognizes a strict boundary between the inside and outside of the input image. Points falling outside are filled. Points falling inside are interpolated, using replication when they're near the edge. A close up look helps show this more clearly. We choose XData and YData to bracket a point near the lower right corner of the image, in the output image space, the resize with 'nearest' to preserve the appearance of the individual pixels. 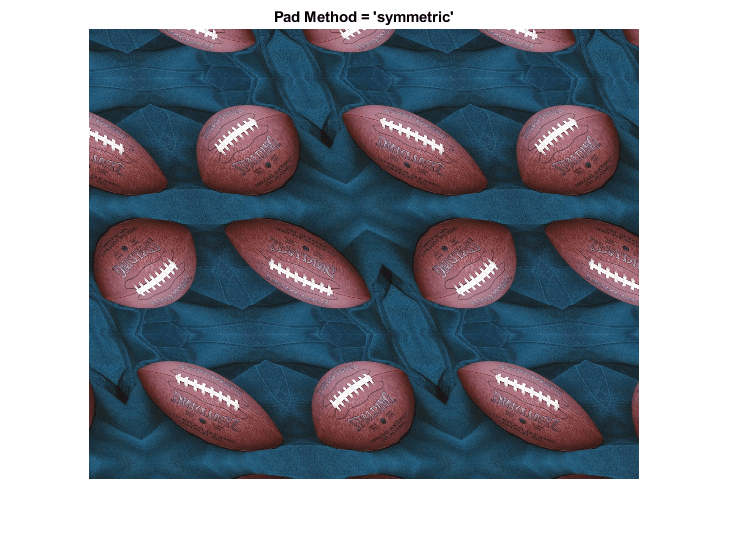 The remaining two pad methods are 'circular' (circular repetition in each dimension) and 'symmetric' (circular repetition of the image with an appended mirror image). To show more of the pattern that emerges, we redefine the transformation to cut the scale in half.